After what feels like forever, RiME is finally touching down on Switch. The original game had already endured a tortuous development period prior to its launch on PS4, Xbox One and PC earlier in the year, but Nintendo fans have had to suffer an additional wait to get their hands on this promising adventure, which draws comparisons with the likes of Journey, ICO and The Legend of Zelda. The good news is RiME presents an enchanting experience which can stand alongside those legendary titles in terms of atmosphere and immersion, but this is tempered by the fact that bringing the game to Switch has resulted in a less than satisfactory conversion. 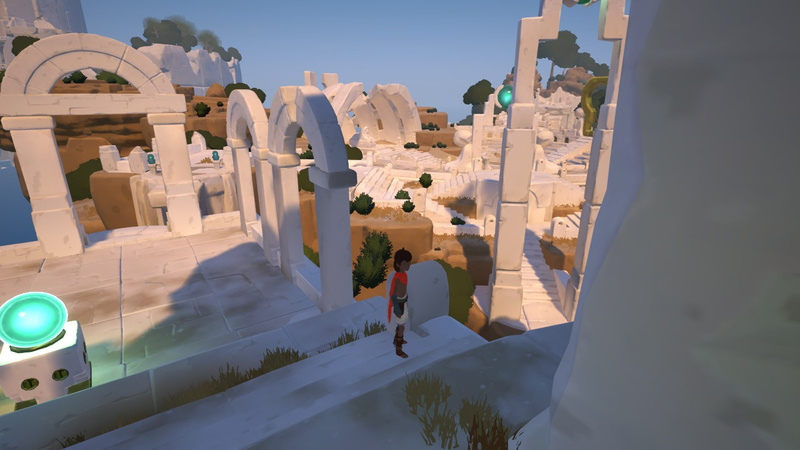 RiME is a game which takes delight in avoiding exposition. You're told literally nothing about the game's story; all you know is that you control a young boy who washes up on the shore of a mysterious island covered in ruins and other strange structures. Soon in your adventure you'll befriend an inquisitive fox and – piece by piece – you'll uncover the history of this bewitching, sun-drenching location. 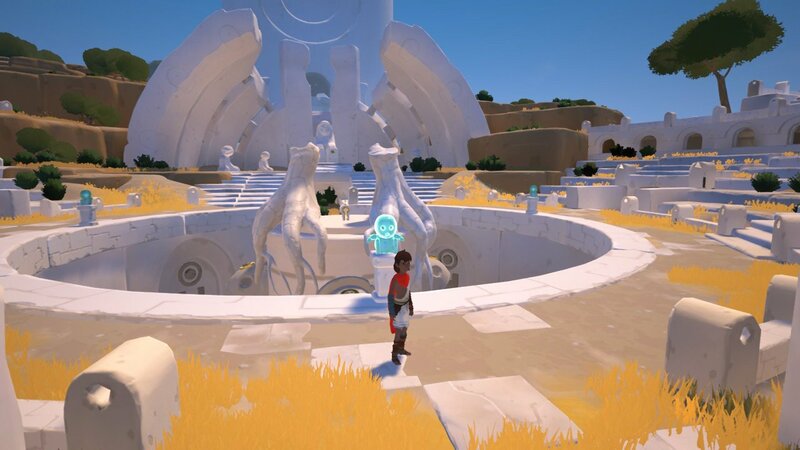 RiME's controls are also kept simple; you can interact with objects, run and crouch, but by far the most important command is your voice, which is used to trigger elements of the environment. Your character is able to shout, giggle or simply mutter to himself; these commands are contextual and depend entirely on what's nearby to interact with. At the core of RiME you'll find exploration and puzzle-solving. There's no hand-holding here, and you need to work out solutions unaided. An early example sees your pathway barred by a wild boar. Beyond the boar you can see the remains of fruit - the same fruit which has fallen from a nearby tree. Pick up the fruit and place it in front of the boar and it leaves its post to consume the meal, allowing you access. This is at the basic end of the scale and other solutions require not just mental dexterity but fast reflexes; these are combined with platforming sections which see you leaping from stone pillars and using hand-holds to negotiate certain areas. 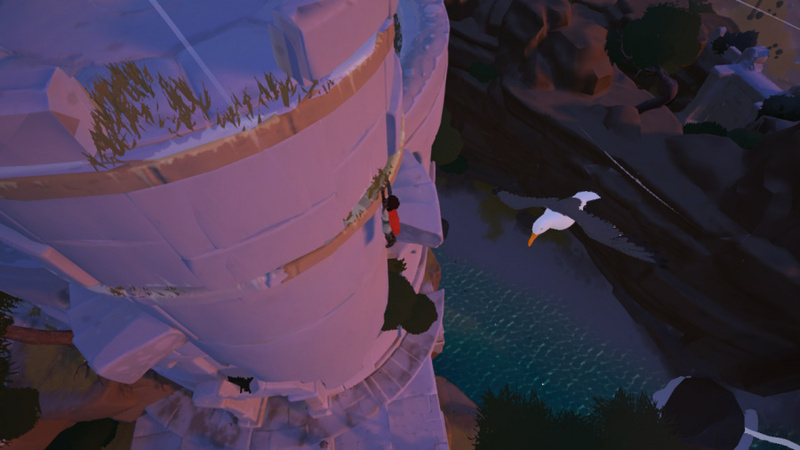 RiME layers puzzle on top of puzzle to create a satisfying stream of problem-solving which ultimately serves as the game's biggest draw; don't expect Zelda-style combat in this game, because there is none. A special mention has to go to the world the developers have crafted. Governed by a real-time night-and-day cycle, the island is covered with structures, wildlife and flora and is surrounded by gorgeous deep-blue waters. The mediterranean feel permeates the entire experience, while the sumptuous contextual soundtrack places you in the moment perfectly, adding a sense of scale to proceedings but also delivering some of the game's most memorable atmospheric moments. 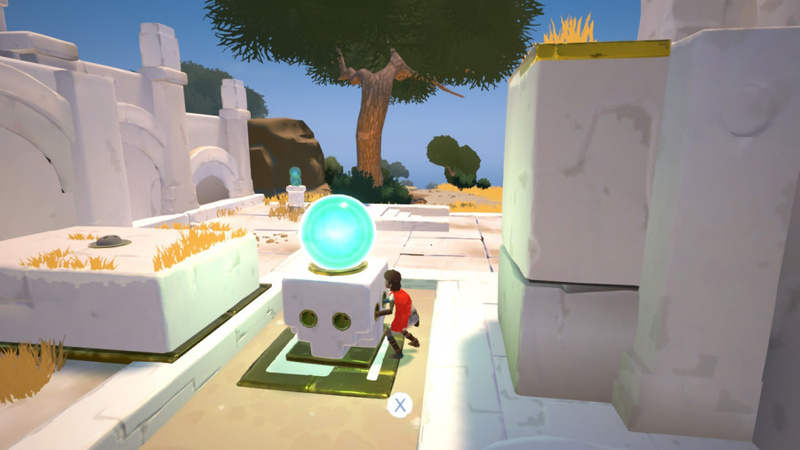 When twinned with its rewarding cycle of wordless puzzle solving, RiME offers up quite a stirring gameplay experience. There are some issues present which need mentioning, however. While RiME is comparable with Zelda: Breath of the Wild from a purely aesthetic perspective, it doesn't offer as convincing a game world as Nintendo's title. 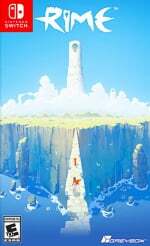 In Breath of the Wild it felt like you could literally go anywhere, and while RiME also employs a "if you can see it, you can reach it" ethos, there are moments when its inflexibility becomes annoying. For example, our hero is able to scale certain blocks but, when faced with smaller, knee-high boulders off the game's beaten track, he simply cannot negotiate them. It's clear that the developers have, to a certain degree, created an illusion of freedom here, rather than true freedom; where you're supposed to go the pathway is clear and obvious, but if you decide to strike out and explore, you'll find dead ends and unclimbable surfaces abound. Another issue is the controls, which don't ever feel as responsive as they should. The camera – controlled with the right-hand stick – is sluggish to respond to input, which can make some of the trickier platforming sections unnecessarily annoying. The camera also refuses to play nice in certain situations when walls and other structures prevent you from getting a clear view of the action. Add in some similarly spotty button and directional commands and you've got a game which tests your patience more than it should. The game's modest length may displease some players, too. Depending on how you approach the experience, you can expect to see the end credits in around 8 hours; fully exploring the island for bonus collectables will surely extend this figure, while those who are equipped with excellent puzzle-solving skills (or a guide) can perhaps finish it all off in around 6 hours or less. That's quite short when you consider the amount of time it's possible to invest in Breath of the Wild, but it's not to say that RiME doesn't offer any replay value; rather cleverly, the developers have made in-game collectables permanent, so if you don't manage to get them all on your first play-through then you can seek them out on your second while retaining those you've already found. That RiME is a stirring and enjoyable experience will not be news to anyone who has already played the game on other systems, or heard feedback from those who have. Sadly though, the Switch port does suffer from some irksome niggles which make it, on paper, perhaps the least pleasurable way to experience RiME. When playing in docked mode the resolution appears to be 720p, and while the game is undeniably handsome there are serious frame rate problems almost everywhere you look. When navigating some of the more detail-rich locations the game stutters quite alarmingly. In handheld mode, things are even more dire; the game is rendered at noticeably less than the screen's 720p resolution, resulting in a fuzzy appearance that almost looks like a tub of vaseline has been smeared all over the display. Despite the significant drop in pixels the game's performance is just as woeful – the stuttering got so bad at one point that it gave this reviewer motion sickness, as the delayed camera controls conspired with the wildly fluctuating frame rate to create a deeply unpleasant visual experience. RiME on other consoles could hardly be described as a faultless technical spectacle, but on Switch things are significantly worse. RiME on Switch is a disappointing experience, despite the obvious quality of the game itself. 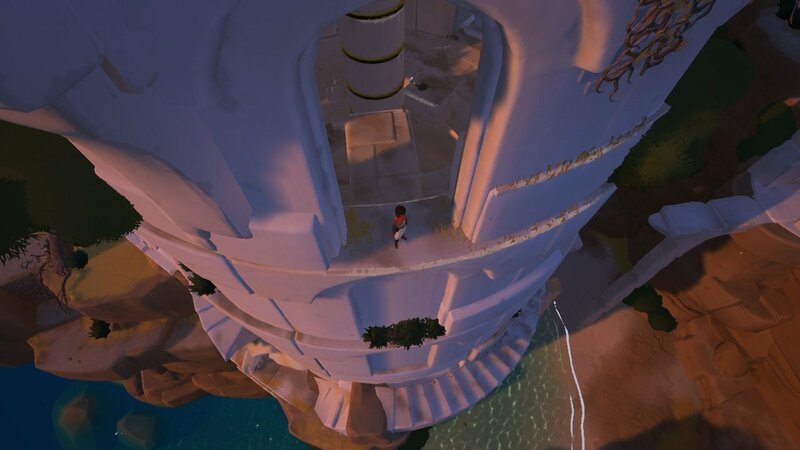 As a puzzle-led adventure RiME is enjoyable, atmospheric and at times deeply moving; all of these qualities are undone by spotty performance, low resolution visuals and a frame rate which sputters along like a battered car engine. When played docked things are just about passable, but in handheld mode the game's technical problems sap away the satisfaction of playing it. If you have any other means of accessing the game on other systems then you should pick those over this port; while enough of RiME's magic remains on show, the Switch version of the game is almost crippled by technical problems which unfortunately rob this captivating quest of its lustre. Called the performance issues ages ago. No one believed me. Worst version of the game and costs more. I was set to get this but a lazy port and now I'll be passing! Shame. It seems weird that this game has so many performance issues, seeing as the graphics don't really look like anything the Gamecube couldn't have pulled off (though this is in higher resolution, natch). "... the stuttering got so bad at one point that it gave this reviewer motion sickness..."
Yikes, kind of amazing it got a 6 to be honest. I played the PC version on a official stand of the publisher in a gaming con. Perfomance was garbage. In videos, the Switch version doesn't look that bad, I might get it if the dev.s patch it or the price drops a lot. Thanks for the review as always and calling it like it is. If this was the same price as the other consoles I'd give it a go and hope for a patch that could fix the frame rate & control issues up. Unfortunately it's 1/3 more expensive and with the glaring technical issues I'll have to pass this up. Too bad bcuz I was really looking forward to this one but I was always on the fence because of the price, if it didn't have the issues I could justify it for the portability but now it's most definitely not worth it. If it goes on sale and they patch of the technical issues I'm on board. This is really sad. I played this earlier this year on PS4, it really is a special game. Too bad they couldn't get it running well. Bad port, will get skipped in favor of good ones. And there's plenty of good ones (DOOM, Skyrim, LA Noire, etc). If they patch it, then I'll be happy to grab it. Oh man...what a bummer...I was really looking forward to this one. Would a patch be able to fix enough of the issues to warrant a purchase? Maybe they were trying to make it out by November and had to cut corners? You say that about every game- even a broken clock is bound to be right twice a day. And bring enough games to Switch, there's going to be a few bad ports. But for every bad one there's a dozen goof ones. Like Rive, which actually runs better than the PS4 version. Fancy that. And it's not necessarily more expensive. It's the same price digitally, and the physical version includes a sound track. @JaxonH its not really a bad port. This has performance issues on PS4 and PC. That’s a shame. Looks like something I may have enjoyed, but I’ll be passing unless I can get it very, very cheaply at some point. I wish we could get Ico or Colossus on Switch, but obviously that won’t happen. Hey everybody look, it's Nostradamus! Very sad. This was on my "to buy" list, but now, it's on the "maybe some day" list, provided that some patches will be made available to make the experience more tolerable. Or... I just might get it on the X.
I thought I might buy this at some point in the future when it's cheaper but it sounds really bad. 6 months late, more expensive, it's very short and all the bugs, I think I'll leave it. Edit: And now I hear the file size is nearly double that of the XB1. That doesn't even make sense. Twice the size and it doesn't look as good. Perhaps they should have got some external help. Wow. All that extra time for what? I fear Yooka Laylee will share the same fate - extra dev time, terrible performance. Huge disappointment. Glad I cancelled my preorder. Honestly, after reading this review and hearing Alex‘s comparisons between the Switch and Xbox versions, I‘ve decided to outright cancel my preorder of the Switch version and buy the PS4 version instead. Saves me 10 bucks, too! I‘m rather sad to do this but this is just bordering on unbearable. @GrailUK the original engine has serious problems. The developers can't perform miracles. Hope they will update the game soon. I will wait until then. I cancelled my preorder last week as I simply have too many games to play, but I’m disappointed to read this review none the less. Stuttering frame rate? Less than 720p on handheld? For graphics like these? That is simply unacceptable. At any price. I’ll take NL’s advice and play it elsewhere. Shame that. I'll pass then. Too much good stuff elsewhere. Yep like others, I'll be passing on this. It's a shame but with so many other games on Switch I'll soon get over it. It’s crazy that this one took sooooo long to release and work on yet it’s the worst?? How did this happen??? Shame, I was looking forward to this game on Switch. Luckily there are more than enough games to buy besides this at the moment so I'll pick this up on a sale. @SLIGEACH_EIRE "I think i'll leave it"
Anyone who buys it should be shunned by the community. You don't buy games with crap performance at a higher price. @DanElectrode Honestly I think might just come down to incomptence by the Dev team. How is it that game such as BOTW can run at 900p 30FPS, yet this can't manage a stable a 30FPS at 720p? I can't think of any possible excuse for this. I really have been anxious to play this, but after reading all the performance problems the PC port had, I figured this would end up poor as well. Every time the devs would talk about the game, they would complain and it seemed like ultimately their optimization was just really poor. That's a shame as I hear really good things about the game otherwise. @Moon Don't you dare jinx Yooka Laylee! @kobashi100 It's such a shame. Disappointing considering I’ve waited this long for a Switch version to play the game. But thanks to Amazon muckery I got it preordered for 16 bucks so I will take that and hope a fix comes. Man. I want to like this game, and support the developers for their keen visual style... but can’t do it. Not in this state anyway. @Menchi187 and, yet there shouldn't have been any. There's absolutely no excuse other than a rush to hit a release date. That's probably why no one believed or sided with you. That's too bad. Guess I'll be skipping this game. @JaxonH I just checked out DFs assessment of the PS4 version. That one has an uncapped framerate that hovers around 40 fps and occasionally goes below 30. I think this is just a generally poorly programmed game. Unfortunate cause I really wanted it on Switch. My laptop is beefy enough I can likely run it there though. Might give a day or two and see if the devs say anything about a patch though. @QwertyQwerty I can't imagine why this game should be "demanding," especially in comparison to games that run well and have a lot more going on like The Witcher 3 and Breath of the Wild. Sounds like incompetence on the part of the programmers, to be honest. If the devs can patch the performance issues... I would consider a digital version for $20 MAX... but none of that will probably ever happen... no big deal. I was somewhat excited for it but with a costly Christmas coming up I'd rather use the £30 elsewhere for titles I am sure that I want. May pick it up when price drops. @Menchi187 You're right, let me switch that out. @Nintendoforlife Zelda is definitely not 60fps. Unreal Engine 4 is not the most optimized engine about. Gotta work hard to get best from it. I'll still be getting Rime, hopefully it'll get patched. If the original engine, i.e. the game engine bites, no porting company can help. It's going to take a rewrite, and that is a much much bigger job than a port. @GrailUK the source material is terrible. runs really badly on xbox one too. i'm not surprised by the performance, it already runs terribly on xbox one. Dang. Held out for this version. Guess I'll grab it on the PS4 next time its on sale. @kobashi100 Yep I provided incorrect info, I switched it out. But still this game is unable to hold 60FPS on the PS4 pro? It just seems so far fetched to me. And yes, my god, this looks atrocious! I don't get it. Wasn't it reported that the Switch version would run better than the PS4 version at one point? What happened to the promise of it being 1080p60? I KNOW this was said by the developers at one point. Bah.i was looking forward to this too. I can forgive most things in a game or genre I like: so so graphics, bad story,, crappy music. I can’t forgive poor controls though. Deal breaker . Still, plenty more games in my list and I’m skint, so maybe a blessing in disguise. @kobashi100 UE4 is a fantastically optimized engine. Much better than UE3 was. Just cancelled my pre-order, thanks for saving me some money! Honestly, I'm kinda bummed that this ended up being such a poor execution, I was really looking forward to this game. I'll wait and see if they're able to salvage it through patches in the future, but given the turbulent development, I won't hold my breath. @Agent721 @AcridSkull @Nintendoforlife It seems this game runs poorly on all machines including PC, which blows my mind. Clearly it's more of an optimization issue, give it up to poor coding of the original engine. I'm actually going to pass the game up on all consoles. If 6 months down the line they still haven't patched it up on the big consoles I don't see them being able to get it running any better on Switch anytime soon. Hopefully I'm wrong about that though. I'd love to see the performance and graphics in handheld mode improve. Another lazy port by Tantalus. This is so disappointing. I'll be keeping my eye on other coverage and patches, but frame-stuttering is just something that I can't overlook (given an over-sensitivity to motion sickness). What a shame that they couldn't get it running well on the hardware, despite what has clearly been quite a bit of effort. @shakim1972 thanks for your input, troll. Any other words of wisdom? Come on, devs. Quit being lazy with your ports. Technical hiccups aside... I bought it on PS4 and found it very boring. Biggest disappointment of the year for me. @electrolite77 Ah, my bad: I should have mentioned that the X is also on my "to buy" list, along with the Switch. For now, I'm still stuck midway last gen with an Xbox 360 and a Wii U. A friend of mine is pretty damn satisfied with it, though. None of those sneaky, pathetic checker-boarding shenanigans to simulate a "real" 4K experience. The X truly is the most powerful console that money can buy right now. Come to think of it, poor optimization isn't even a surprise, considering the entire history of this game's creation. @ThanosReXXX when i finally get a 4k TV the Xbox one X is definitely the gonna be purchased. It's a beast.. MS really did do a great job. Oh dear. It was never really on my radar so no loss. @NESguy94 I am so reluctant to call the developers lazy. Imagine being asked to port a game which involves using an engine that already has serious performance issues to a system which is far weaker. It's not an easy task. @Cathousemaster It's definitely not the engine's fault. Unreal Engine 4 is literally THE most versatile and programmer-friendly game engine available right now. The problem lies with the fact that the game was badly optimized to start with, and during its more than 5 year development cycle, they changed engines 3 times, finally ending up with Unreal Engine. But the game was already a shoddy set of assets long before they got to that point, so in a way, it's actually a miracle that something even remotely playable came out of it. I had high hopes, and they definitely fooled me. In one interview, the head designer/developer said that all the problems had all but been resolved, so only minor issues remained. @kobashi100 Yeah, it sounds like the game has performance issues everywhere and not something introduced by Tauntalus for the Switch version. @kobashi100 They sure did. And for me, it's the only option: seeing as I still have Xbox Live Gold, I've been collecting dozens of Xbox One games alongside Xbox 360 games, and right now, I can only play the latter. That’s fair, however their port of Twilight Princess felt truly lazy. Many textures were left low-res and everything pointy and angular meaning they did very little in terms of updating the character models. For those of you saying it has performance issues everywhere, just look at a graphics comparison video. Things are way more stuttery on the Switch. I was looking forward to this, but now I've canceled my preorder. I typically could ignore glaring issues like control problems or game length but if I am supposed to become immersed in a beautiful game world, the frame rate has to be solid. Perhaps a patch? Or did the developers knowingly released this game with performance issues? @Nintendoforlife @Ralizah Competence, or lack there of, goes a long way when it comes to running a game. I suspect the devs of this game severely underestimated what it takes to make a game and just didn't have time to get things working well. When it comes to optimizing a game having a "good engine" is only the start. There's a lot of techniques and proper practices when it comes to making things work well and work fast. Models could have extra verticies clogging up the system. There could be too many draw calls, assets not properly culled etc. On the programming side poorly coded algorithms can cripple a computer. So many engines today advertise how you don't even need programming knowledge. The thing that people don't realize is there's a lot more to being a software engineer(yeah programming is an engineering degree in school) than just being able to read a program language. We tend to think today "oh we have so much processing power who cares how a lower graphic game is made." And that's where people get into trouble. What a shame. This game really gave off some sweet ICO vibes, too bad the performance issues really bring it down. Such a shame. Oh well... November goes from 6 must-own games to just 5. I couldn't decide whether to get this on Switch or PS4 but looks like this has made my mind up for me! Man. I guess I'll get in on PS4. @Yorumi Honestly I guess we've become accustomed to a certain level of skill when it comes to optimization. So anything that does not meet those standards is foreign to us. @Nintendoforlife yeah it's kind of staggering when you actually get into it. A lot of people put together a little proof of concept demo and think "yeah I can do this." But it is amazing just what it takes, especially with 3d games. 2d games a much much much more approachable. It happens even to professionals too, look at star citizen. They're making progress but obviously their initial projections were wildly optimistic. Never understood all the hype for this Switch version seeing that it got poor reviews on other consoles. I’m sure this game will be a PS plus title sooner or later. @shakim1972 wtf? Are you high? Seems like Unity still doesn't work very good on Switch. Remember Overcooked. I think we got ourselves a real live keyboard warrior! But with all the problems I’ll be forced to skip it until a patch that solves those problems is released. Ah I see. No need to apologise, thanks for the reply. I've got a PS4 Pro under my 4k (non HDR) tv and an XB1S under the 1080p TV in the kitchen. Pondering trading them both in for an X and hopefully picking up a cheap PS4 slim on black Friday. The PS4 itself is good but my Pro runs so hot and noisy it's ridiculous. And it's ugly. The X looks a gorgeous bit of kit. @gortsi - If you’re playing along at home, that’s the free to share my opinion space and B1 for belligerence, both in a single post, good for a 2x combo of ignorance. Well done @shakim1972 . @electrolite77 Why trade in both? So, you're keeping the vanilla PS4? Personally, I think I would let someone check that Pro out, maybe something's wrong with it, and regardless of my own sentiments, it IS the best PS4 around. Even though I am no Sony fan myself, I would never bash Playstation owners, since they apparently found something on there that interests them, otherwise they wouldn't have owned one in the first place. As for HDR: does that really make so much of a difference if the TV is already 4K? I'm trying to make my slowly dying plasma screen live at the very least 4 to 5 months longer, by which time I might be able to reserve enough cash for a down-payment on a new TV. HDR and QLED were already there for some time, but most brands are still ridiculously expensive, and I'm not about to spend more than a grand maximum. Prices over here are also less customer-friendly, so dollars are simply translated to euros and then there's the EU VAT on top of that, so all in all, stuff is a bit more expensive over here. @shakim1972 - Nope. Not mad, not a boy, and not blaming anyone for anything. Well, maybe I’m blaming you a bit for representing yourself the way you have here, but that’s all the blame I’m passing out. Was waiting to pull the trigger on this as well but I guess I'll pass too. Bummer. @GrailUK TPHD was a pretty bad as far as ports (remasters) go IMO. It still looked like a Wii game, and I would've preferred a straight up VC release if I had known the end result beforehand. I mean, TPHD wasn't unplayable, but it looked pretty bad for a Wii U game, which kinda defeats the point of a remaster. They should take some notes from Bluepoint Games, they're absolute masters when it comes to ports and remasters. Phew. Writing my Christmas list and almost put this on it. Thank you NL for the timely review, would've been a shame if I had wasted a loved one's money on this if it's that bad of a port. Thanks for the timely review, @Damo ! Pre-order cancelled, disaster averted, and Ittle Dew 2 ordered instead. Cost less too. Motion Sickness? Ouch, that sounds like an awful port. Since it was drawing some parallels with The Wind Waker, I wanted to give it a try but I’ll pass, at least to see if they patch it in the future but I don’t have many hopes for it. Shame. Would love more information on what happened to this port, considering Tantalus is quite good at porting! I've been waiting with a pre-order on this for a LONG time (April?). Super disappointed to read about motion sickness - I'm unclear if it is just when playing on the go, but I am very motion sickness prone, so...sadly...canceled my pre-order. I'm willing to give it a go, but I can't spend $40 on a game that I might not even be able to play, sorry. Based on what everyone is saying around the internet, I expect this game will not sell well and will quickly be discounted. If I see it for $10, I'll give it a try to see if it is a motion sickness inducing problem for me. I just can't risk it as I get sick easy and many reviews are calling out the problem - $40 is too much to pay for a game that is likely to make me sick. SAD - b/c I really want to play it. Back to Mario, Zelda and Arms. @bimmy-lee Damn I missed it. Saw his posts, looked like he got lost on the way to youtube. Ah well. Well, as you may have already read in some of my comments, or might have seen in my profile, I'm of "above average" age, and my gripe with Sony literally happened decades ago, and consists of them screwing me over three times: once with the repairs of a pretty expensive Walkman (yes, one of those things that you put audio cassette tapes in), who somehow were far from perfect, resulting in the device never working as good anymore as it did before, so I ended up trading it in for one from another brand that was cheaper and still performed better. Don't even know what the brand was anymore. Second, they screwed me over in pretty much the same way with a VCR, which also broke through no fault of mine, I sent it away for repairs, but it was only just within the limits of my warranty. But then, someone at Sony screwed up, because my repair ticket apparently got "lost" and only resurfaced again well over a month after my warranty ran out, meaning I had to pay for the repairs myself, otherwise I wouldn't have gotten my VCR back. Suffice to say that where it concerns VCR's, that too was my last Sony device. And the final nail in their coffin was the whole Lik-Sang debacle. More info on that here, in case you want to know all the details. Lik-Sang was an import site for games and game-related apparel, much like the still existing Play Asia. So, Sony decided to put pressure on them and threaten them with a very expensive law suit if they wouldn't stop selling them. By then, they had already halted all such behavior, mod chips weren't even a thing anymore when Sony sued, and Lik-Sang's management had gone through a whole lot of trouble to reinvent the company and go completely straight, but none of that mattered to Sony. Also, they forced them to pay damages, while disgustingly enough, Sony employees/developers from all regions were buying import consoles and handhelds from Lik-Sang for years already, especially the PSP, which was popular back then, and they did so under the excuse of play-testing and error checking in all versions of the games they were making. Apparently Sony themselves didn't provide for the handhelds themselves or whatever, but either way, the whole story seemed (and still seems) highly hypocritical to me. Anyways, suffice to say that Lik-Sang didn't have the money to pay Sony the damages of all those "illegally" sold import PSP's, let alone to pay an expensive law suit, so they were ultimately forced to file for bankruptcy, and all outstanding orders from clients were subsequently cancelled, except all the money went to paying what they could to Sony and possibly to their own, now jobless employees, so the customers were last on the list of being eligible for damages paid, or actually: weren't on the list at ALL. When that had happened, I vowed never to buy any device from them anymore, and I've been able to keep that promise to this day. And save for a few games that I do find interesting, I haven't missed them either, so for me, it's just Nintendo, Xbox and PC. This game is being favored with a 6. The game on the whole, anything off the PC is a disrespectful release but the Switch in particular is a kick in the teeth after being spat upon. Clearly the small team who made this engine over probably too many years got in over the heads and oafishly threw band-aid after another at it to make it tick. None of the console/handheld releases are good when it comes to fluidity and fps stability, but to then sully the Switch with much of the secondary detail being removed and an even shoddier framerate shows how badly the game was made from the inside out before the farmed out broker ported it. The PC game even runs not great unless you keep it in a 720/1080p level. Very disappointing incompetent release for Switch and in general on the whole. I still want it, but I'm leaning on a fall/winter GoG sale for 33-50% off as I have good hardware to get it running at least right. 19.99 on PS4. No reason to pay twice as much for a crap version. @bimmy-lee By the way: weren't you the one that I was talking to about TV's the other week? Passed on the other console versions waiting for this one as I wanted it on a portable and was happy to pay a premium for it. Having watched a couple of videos it does look very bad and motion-sickness inducing. It doesn't seem to run very well on anything though. By the time I have a PC powerful enough to run it I'll probably have forgot about it so unless it turns up on PS Plus or GWG I doubt I'll ever play this now. Ho hum. They've also got a whole bunch of related game videos, to compare the various systems. Of all the new game system they could have reviewed, they pick this one?! Did anyone there notice there's been a LOT of games overlooked lately?! It's ok, I am not into that game. I wonder that doom could play so good and rime Could play that bad. What's up with that? I try not to make pre determined judgements about games, but this one just never sat quite right with me. I wish it had worked out though as it was a pretty early commitment to the Switch, and I can see a lot of people were really looking forward to it. @gortsi - Unreal, it was like a double xp lootbox just fell out of the sky, and into our laps (I actually don’t know if that’s something that comes in a lootbox, just seems timely). @WiltonRoots - Perfect! And it was all stated with the eloquence of a bull elephant in rut. At least he was able to state the source of his anger in his reply to me. @ThanosReXXX - A shame because I was working on a four corner bingo, and I really had my eye on that Walkman on the prize table (had one, thought it was the apex of technology for a while). We were discussing televisions recently. I watched the videos you posted, did a little reading on the LG OLEDs, and even popped in Best Buy when I had a free moment to check them out. They’re impressive, and right around the price range I was hoping for. I’ll check the DF video you linked, but I think I’m sold. Hopefully it’s going to be a really expensive Christmas! @ThanosReXXX not a fan of Sony then? I expect the inevitable performance patch later on that many Switch ports get. I'll wait until then. Sad. Looks like it could have had a great launch on Switch. The fact that it's late, is out on other platforms for less money, and has performance issues will DOOM this release. Looks like it could be great down the road. If BOTW is a little complex for you this could be decent. Puzzle solving & no fighting. Once it gets a patch, comes down in price, & I'm looking for a game I may give this a shot later on. This was on my must buy list until the reviews came out. Ug. The stuttering is just not acceptable. The graphics are so much like Wind Waker - and they can't even make it perform as well as the original GameCube version. If they manage to patch it, I will consider it. A shame. At first I wasn't happy over the whole price debacle earlier, but got over it and gave some reconsideration. Now with all these reports of terribly poor performance, I guess I won't be getting this after all. I hope they eventually patch it. Been saving this game for the Switch. Would've felt right at home. Guess I'll pick it up on PS4 once it's heavily discounted. I was hyped for the game before the first delay. After the second delay I have cancelled already my pre-order and remembered that the game exists only this week with the ads everywhere. Sad, but I will wait until the game drops under 20€ to buy it (as I will do with Troll and I and some other games in my list that I think just not worth the price). There is simply no excuse for the performance issues. This game seems like it could run on PS3 or Xbox 360. The Visuals are nice but nothing ground breaking or super detailed. The game doesn't seem like it has any abundance of mobs or particle effects. Poor programming, poor optimization. What a shame, this game looked like it would have been fun. @Menchi187 ..."worst version", but not in a good way, like Doom. Given what this game looks like, feels like and clearly aspires to be like, I think it's bizarre that they decided to be this slap dash with their Nintendo port. Should have been the definitive edition when you think about it. @QwertyQwerty better consoles?how do you define better? Not intrested in effectively an indie game for that kind of money anyway! So much good stuff incoming! I was never going to pick this up on Switch. I figured it'd be DOA anyway with the higher price tag and multiple delays. Vote with your wallet, life's too short for crappy ports. Probably picking it up when there's a Steam sale, because I love the art style. However, I'm not surprised by this 'bad' port since most versions of the game are a mess. @KIRO No, not really. Would you be after all that? But it's not Sony-specific: I apply the three strike rule to every company or person that screws me over. As for your choice in TV's: good ones. Maybe that video I posted in comment #118 might be an interesting one for you too. Darn, I was looking forward to this. There is no drought on games so, I'm moving on, maybe they will update it and I change my mind. @ThanosReXXX just wanted to say I read your Sony story and don't blame you. When I was a kid in the late 90s I used to hate Sony because I felt like they stole Mega Man, Final Fantasy, and others from Nintendo. I now know that's not exactly what happened, but it sure felt that way at the time. @BlueKnight07 Thanks, I can appreciate that. I really don't hate Sony, though. I mention that sometimes, but that's only for fun. @gloom I’m thinking it’s pretty obvious that the devs had a tough time programming for the Switch. I’m hearing the file size is larger than other formats and it runs slower. Sounds like some really sloppy or just plain inexperienced coding. I bet they'll have an update at some point that addresses this issue. I'll wait on that, because I've been very excited for this game! @ThanosReXXX I get that...I wouldn't say I hate them now, either. I would still rather spend my money elsewhere. @BlueKnight07 Yep, I can definitely say that I wholeheartedly share that sentiment. Yes, Rime is COMPLETELY UNPLAYABLE on the Switch. DO NOT BUY until a major patch is released to address the abysmal frame rates and stuttering issues. So disappointing, had been looking forward to this game on the Switch for months. The developer released a statement acknowledging frame rate issues in TV mode but claimed the gameplay is fine in handheld mode. This is total BS. Even in handheld mode this is the worst performing Switch game I have seen, by a factor of 10. So bad that after attempting to play it for less than an hour I called Nintendo eShop support and demanded a refund. Tequila Works, if you are listening, I will gladly re-purchase Rime once you release a patch that remedies the atrocious stuttering and makes the game playable in both TV and handheld mode. In the future, if you can't deliver a game to the Switch platform that performs acceptably in both modes, do us a favor and just don't bother. @ThanosReXXX I haven't played it, so I guess it's not fair to pass judgement. For the record, I wasn't blaming unreal per-se ... Rather that unreal can encourage some level and lighting design that doesn't scale well across many devices. But hearing that they switched engines 3 times, it makes you wonder... Did they model and design everything first, only to realise it doesn't work "real time"? Or did they all own super-high end systems, such that only when the game was finished they realised it doesn't work for anyone else? This is a strong advantage of console development BTW ... Because it's running on target hardware from day#1, you see the problems from day#1 .. not just before release. @KIRO The Dutch airline company? What's up with that? @Cathousemaster Far as I know, the game was originally intended for PS3, running on some custom engine. Assets were all customized towards that engine AND the hardware, so after they abandoned that version and/or engine, stuff probably had to be re-written, or at the very least partially remade, and I suppose that didn't do optimization for the next engine any good. Development also kept getting delayed/obstructed by all kinds of factors, and eventually making the choice to go for a third engine change was, although kind of logical considering they wanted to put the game on multiple platforms, perhaps actually rather counter-productive. Well, at least, where the end result is concerned, seeing as the game isn't even running smoothly on the more competent platforms, while that should be no problem whatsoever with a type of game like this. A pity that this port performs this bad. I really wonder what went wrong at Tantalus. @Johnvlachos I got it for Christmas and I've played a fair amount, I agree that while the frame rate issues are definitely there, the puzzles and score and overall feel are engrossing enough that you can mostly look past it. It did just crash on me all the sudden and apparently deleted my save file, which is way more of a problem, we'll see if it happens again at the same spot, I guess. @Johnvlachos I later realized that I had just accidentally re-launched it with a different user profile so it didn't actually lose my save, which is nice. I got past the part where it crashed on the next try too. Also got this game for Christmas. Played for a good 90 minutes or so this morning. Visually, it’s disappointing so far (playing handheld only since i’m traveling). I am enjoying the puzzles, however. Since I got the game for free, I’ll finish it out, unless the hiccuping creates a truly unplayable experience. I just finished this masterpiece. Without doubt one of my most memorable gaming experiences to date. Moving, beautiful, thoughtful, imaginative and focussed. For me, this is - without hesitation - a 9/10 game, and perhaps even a 10/10 game. I don't think it put a foot wrong, it did exactly what it set out to do. I only had frame rate issues a handful of times throughout the game. Comparing RiME to BOTW: both games have frame rate issues. They are more frequent and less severe in BOTW, or less frequent and more severe in RiME, depends on your point of view. So, I can see the reasoning for the 6/10, which may have been valid at the time, but it seems that the subsequent patch has improved the performance to an acceptable level. For reviews like this, I think perhaps a re-score or addendum is needed. What do you think @Damo?